I recently attended the Smart Cities Connect conference in Kansas, MO. There, I moderated a panel on data marketplaces and collaborative approaches to smart city solutions. The event demonstrated that there is a growing body of interest in smart city solutions. It also highlighted several themes that should dominate the agenda in coming years. The more interesting topics included collaboration, interoperability and principles of data monetization. City authorities, it appears, are beginning to recognize the need for collaboration, amongst themselves and with private sector partners. This may be due to economic realities and affordability concerns, particularly for small and medium sized cities. Operational realities are another factor. Traveling from point A to point B, for example, can involve several modes of transport. Journeys can also cross city, county and state boundaries. This requires coordination among service providers and jurisdictions. One anecdote at the event came from a county with a sizeable and qualified workforce. Its neighboring county had thousands of unfilled job vacancies. The difficulty in filling those job openings came down to a lack of coordinated transportation solutions. The debate around smart cities is shifting with several speakers introducing the term 'smart region'. This has parallels with new planning frameworks  from the UK around primary urban areas (PUAs) and travel-time to work areas (TTWAs). On the data monetization theme, a couple of local-government speakers expressed the view that citizens had paid for a city's data and that is would be inappropriate to profit from this. It is worth a moment to unpick this point of view and assess its implications. Yes, citizens have paid for a range of city services through their taxes. It so happens that data is a by-product of some of these services. In other words, citizens have paid for a service and not for the act of collecting data per se. Over the short term, cities may incur manageable and moderate costs to run open data initiatives and to respond to freedom of information requests. Beyond this start-up phase, data requests will increase in sophistication. And, cities will need a strategy to cope with a higher volume of requests and new demands for dependable data sets. This means finding different ways to extract value and profit from city data. Currently, much of the data that cities publish is relatively straightforward and readily available. These are informational data sets. For example, they might present the distribution of crime scenes or accident hotspots on a map of the city. This might support basic decision making about where to focus ambulance or paramedic resources. As cities develop their smart city capabilities, the volume and variety of data requests will rise. Cities will also face new needs. These will include requests for more complex data sets such as structured, time-series data and data that cross departmental boundaries. Some of this data will be for local residents. Other data will be for operational departments and private sector service providers who see ways to improve their operational performance (i.e. save costs, improve the intensity of asset use) and innovate (e.g. multi-modal journey planning, safety alerts etc.). Cities will face challenges in supporting these new demands and managing the associated costs. While they will benefit from economic development and a boost in local tax contributions, this will take time. 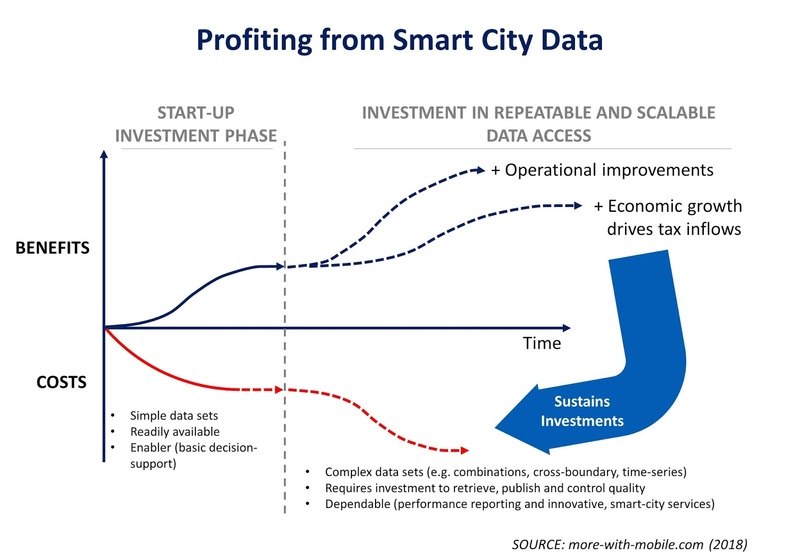 This is where principles of not profiting from city data will change. The agenda is shaping up for more direct and immediate ways to capitalize on Smart City data through new licensing, data-as-a-service and public-private partnership models.